Are you looking for a way for students to build relationships with one another? Well look no further! This getting to know you game is the perfect addition to fostering positive relationships within your classroom. This game can be used for morning meeting, end of the day, or really any time! I will have students pair up with another student and they will play this game with one another. Students will answer questions such as "How can you be kind to your classmates?" 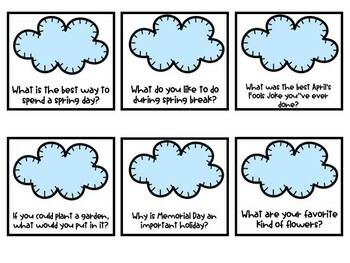 or "What do you like most about spring?" Students will work their way around the game board while being careful not to land on some spots that force them to go back!! The first student to reach the finish mark is the "winner." *I have made this game editable so you can add your own questions to the game! !